The beauty of a great email marketing template is that it can both inspire you and allow you to work more quickly. Need to send an email in a flash? A template is a great place to begin. Looking for a beautiful design to get you started? Customizing a template is the way to go! 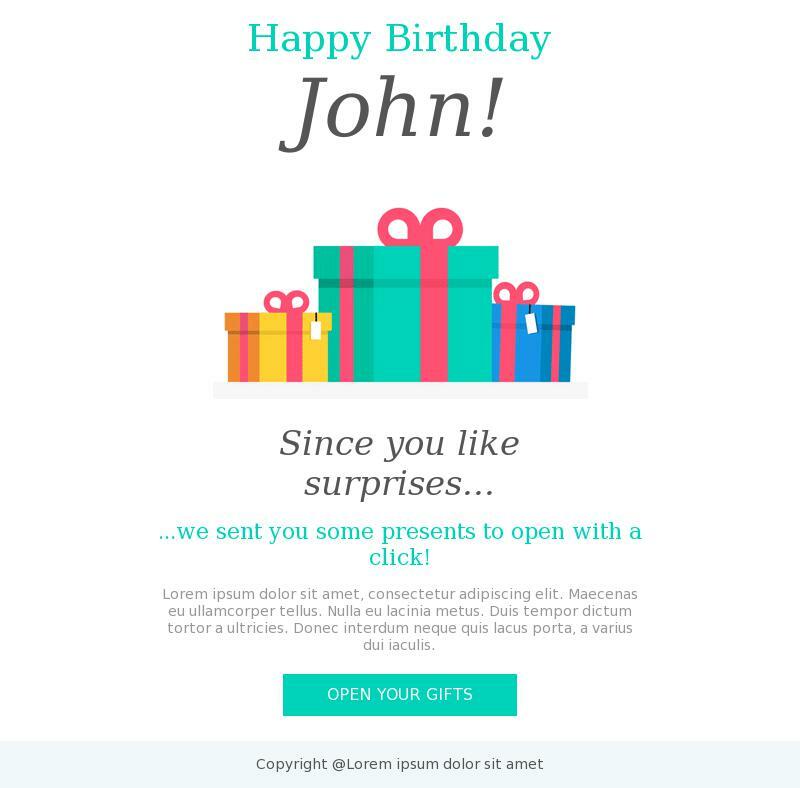 And the good news is, great email marketing templates are right at your fingertips—for free. 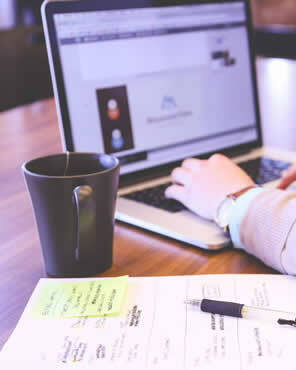 When you use BEE Free, our easy-to-navigate, drag-and-drop editor, you can start from a plethora of customizable HTML email templates. In each one, you can delete and add content, rearrange blocks, replace photos with your own or by accessing our free stock libraries, change button colors, and much more. The templates are all mobile responsive, too. Today we’ll look at 13 of our favorite email marketing templates by BEE, so you can get inspired to make them your own! The Fashion Zine template is a great go-to option for any product feature or announcement, or even a content round-up. You can replace the great hero image and text with your own, then customize the following content blocks. There’s plenty of white space here so this email feels fresh and breezy—perfect for any message you want to present with a modern, elegant vibe. The Coffee Corner News template has a gorgeous dark background, no clutter-y navigation menu, and customizable modules for secondary content. This moody, minimal HTML newsletter template can be customized in a number of ways—replace the images and make it your own! This Download Freebie template is an eye-catching blue with a unique white border. How much does that first CTA button pop, too? (Hint: keep it pink!) If you have a different call to action (other than download a freebie), simply update the text and images, and make the invitation suitable for your message. 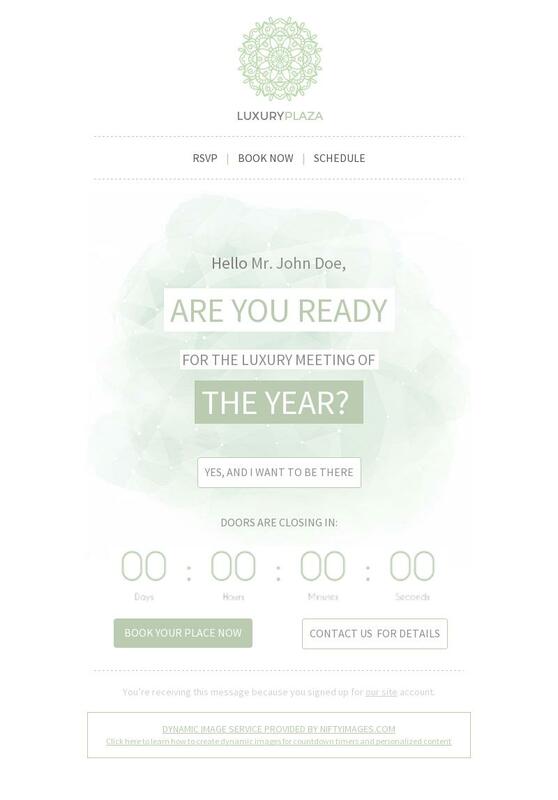 The Countdown to Elegance template has a dynamic countdown timer and a built-in option to personalize the “Hello” greeting in the opener. This template is soft and soothing, with a simple, singular message. In the Cryptonboarding email template, we have a great full-width hero image, followed by numbered modules with individual CTAs. This template is a great option for “getting started” and welcome emails, though you could also update it as an announcement or promotion message just as easily. We love the bold color scheme! 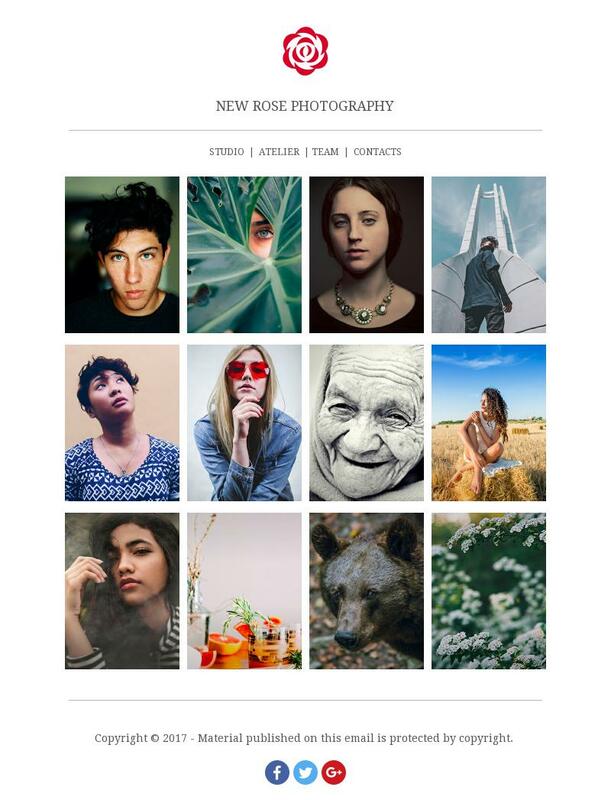 If you’re looking for a great dynamic photo grid, the Rose Photography template is a perfect place to start. It’s an excellent choice for photographers searching for an email marketing template to showcase their work. Or you can use it to feature your products in a beautiful, elegant grid where the images are equally spaced and arranged neatly. Want to add a CTA button, too? Simply drag-and-drop one in, choose your colors and text, link it, and voilá! Here’s another option for a feature or promo message where you want to highlight a gorgeous hero image at the top. The Fashion Promo template is a sleek, minimal option that can be updated in minutes. And if you need to make a splash but don’t have an image of your own, check out the free stock library! Ever just want to say Thank You? 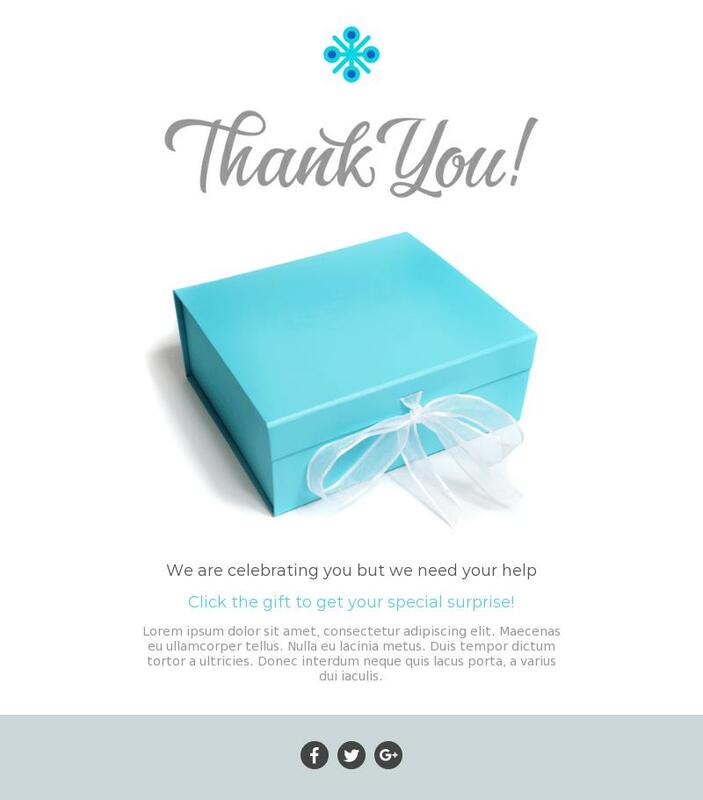 The Thank You email template is a simple, bright option for doing exactly that. 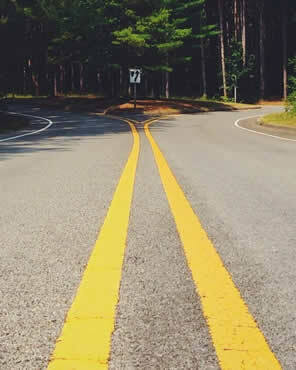 Swap out the image and update the text to make it work for your brand and purposes. Even though this template is about Food Delivery, you can customize it to be about just about anything. That’s the beauty of templates. This one features large, easy-to-read text in modules with varying backgrounds—perfect for telling a story or stacking multiple pieces of content with unique images and CTAs. BEE’s free Last Chance template is fun, playful, and super handy. At the end of a sale, on the last day to sign up, or in the final hours of a free shipping promotion, it’s so useful to nudge readers and remind them to act. 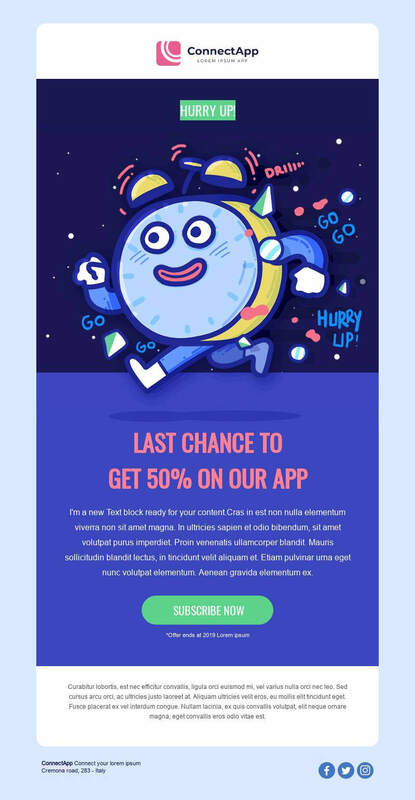 An email like this one can be customized and sent quickly—just update the text and CTA button, and you’re basically ready to roll. This bright, airy Welcome email template is a great place to get started when a new customer subscribes to your list or joins your network. The live text is super readable, the CTA button is easy to spot, and the entire email gives off a warm, friendly vibe. Everyone likes a happy birthday message. Use this Popping Gifts template to send subscribers a celebratory message (and special promotion!) once a year. This Fashion Lifestyle template can be used in a variety of ways, especially if you have great product photos you want to feature. It’s a great example of an email where a two-column design can come in handy, while still welcoming readers with a bold hero image to begin. Ready to get started with BEE’s free email marketing templates? There are dozens more to choose from in our library, and there’s no signup required, so you can start designing immediately. Or you can choose to start from scratch and use our free email template builder. Go ahead, and have fun!